The actual timeline of the history of ancient Rome can be traced back to 753 BC when, according to legend, Rome was founded by two brothers named Romulus and Remus. It originated in Italy and over the successive centuries, successfully conquered the rest of the Italian and then Mediterranean city states. Rome became a republic in the 6th century BC and retained this status for a few centuries before becoming an empire in the 1st century BC. The starting point of the main events of ancient Roman timeline can be taken as the reign of Servius Tullius, the legendary sixth king of Rome, who defined the boundary of Rome in 6th century BC. Rome became a republic in 509 BC which is obviously a landmark event in the ancient Roman timeline. Further important events of ancient Roman timeline have to do with Carthaginian general Hannibal’s invasion of Italy in 218 BC and then the Roman invasion and destruction of Carthage in 146 BC. The start of the Roman Empire and in 27 BC was another landmark event in ancient Roman timeline. A map showing the extent of the Roman empire. The year 27 BC is taken as the starting point of the Roman Empire after the victory of Julius Caesar’s adopted son, Octavian, over Mark Anthony and Cleopatra at the Battle of Actium in 31 BC. After the war, Egypt was annexed with Rome and in 27 BC, Octavian was proclaimed the new emperor by the Roman senate and he took the title of Augustus Caesar. This marked the beginning of the one of the most powerful empires in history which successfully survived over the course of next five centuries. Before becoming an empire in 27 BC, Rome was a republic with the era of the Roman Republic beginning in 509 BC and extended over several centuries. It was mainly during the era of the Roman Republic that it grew from a city state to a power exerting influence over the entire Mediterranean world. The first two centuries of the ancient Roman timeline of the Roman Republic saw the republic expand to include the entire Italian peninsula. 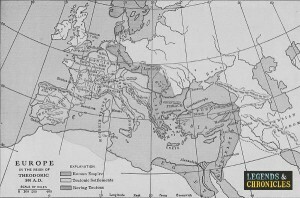 Eventually it expanded toward east as well as west to include France, Greece, and much of the Mediterranean World. By the time it became an Empire, Rome had expanded into three continents. The imperial part of ancient Roman timeline began in 27 BC when Rome became an Empire and Augustus Caesar became the first Emperor. His real name was Octavian and he was the adopted son of the assassinated ruler, Julius Caesar. The first two centuries after the establishment of the Roman Empire were the centuries of relative peace and stability and the period is referred to Pax Romana meaning ‘Roman Peace’. After that, the Empire was almost continuously embroiled in civil wars or wars with other empires, in particular the Sassanid Empire of Persia. 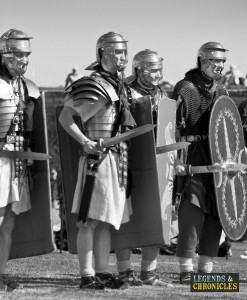 Through the history of Rome, the soldiers were always a constant. At the beginning of the medieval times, the western part of the Roman Empire collapsed in the 5th century while the Eastern part remained functional and became to be known as Byzantine Empire. The western part of the empire remained chaotic for centuries due to constant invasions of the Germanic tribes from the north. The Eastern part, on the other hand, remained engaged in battles with the Persians and then with the Arabs. The surviving part of Rome, the Byzantine Empire, was predominantly Greek speaking with its capital at Constantinople. It was at its greatest extent in around 550 AD during the reign of Justinian the Great. The decline of the Roman Empire was slow and extended over several centuries. The Ancient Rome timeline with respect to decline can be divided into Eastern and Western parts of the empire. The decline was gradual with the empire losing parts in the east and west. On the western side, the empire fell because of constant invasions and migrations from the Germanic tribes. It lost its provinces of France and the Iberian Peninsula before losing the rest of the territory. The fall of the eastern side, known as Byzantine Empire, was to come much later due to the constant expansion of other empires such as the Arab Caliphate and later the Ottoman Empire. The Western Roman Empire fell in 476 AD when Odoacer deposed the last Roman Emperor Romulus Augustus. With this the Western Roman Empire came to an ended and the territory was divided into various short lived kingdoms. The situation over the western side was to remain chaotic for several centuries to come. In the east, the Byzantine Empire remained stable for a few more centuries but constantly came into clash with the Persians, the Arabs, and then the Ottomans. It eventually came to end with the conquest of Constantinople by the Ottomans in 1453. The Ancient Roman timeline goes right back to the founding myth of Rome where it was founded by two brothers Romulus and Remus in 753 BC. Rome became a republic in 509 BC and continued to expand its territories. By the time it became an empire in 27 BC, it had established itself as a major power in the Mediterranean region. The Western Roman Empire fell because of the invasions of the Germanic tribes from the north while the Eastern part, known as Byzantine Empire, remained an empire for several more centuries before it fell in 1453 when the Ottomans conquered Constantinople.